Following in the heels of its...sequel, the first Darksiders game comes to the current generation of consoles in this port remaster. I'm not sure why the first game was remastered second, but like its brethren, it boasts graphical and lighting upgrades. It also has a super smooth frame rate, for better or worse. 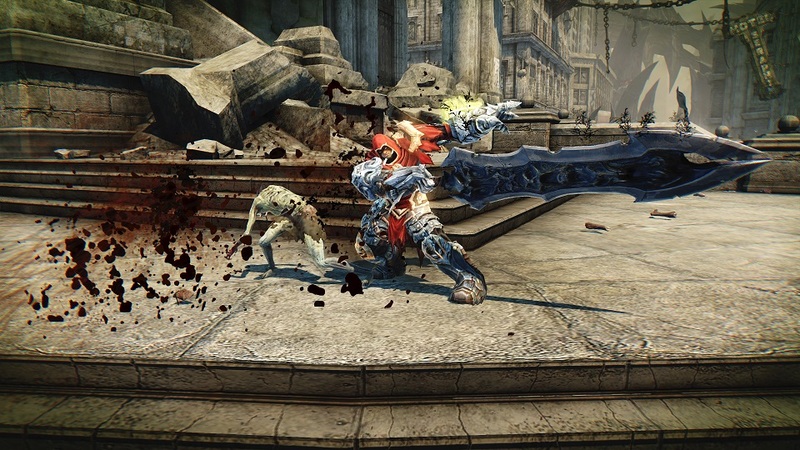 Unlike the sequel, the first Darksiders is pure action and adventure. You attack with War's really cool sword, named Chaoseater, using the X Button. He can continuously chain his attacks together, and also use several purchasable upgraded skills. 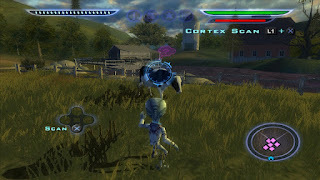 The Y Button attacks with War's sub-weapon, either a scythe or gauntlets. War can block some attacks, but also parry and counter them if you block at the right time. This is really useful, since the game is pretty generous with the timing. It helps add extra damage to tough foes while conserving your health. You can also buy, upgrade, and equip 4 special attacks that take Wrath (the yellow energy under your health). These are actually pretty useful. There are other special attacks you can buy and upgrade, but are used with special input commands. Not fireball motions, but things like targeting an enemy and holding back from him while attacking, or holding the attack button in the air. It's best to try them all out to see what works with your tactics, but I ended up not using very many of them, and used my souls to buy things that I deemed more important. On his quest for redemption, War agrees to help defeat the Destroyer, a malevolent being of immense power that probably doesn't play well with others, based on its name. To do so, he must first find and slay its strongest minions and give their hearts to the one who would show War the way into the Destroyer's black citadel. Each minion is holed up in a different dungeon. Inside these dungeons, there are special items and weapons that will not only help you defeat them, but also give you new ways to traverse the environment and collect treasures. If that formula sounds familiar, it's because it is very reminiscent of the Legend of Zelda. Even so, it is definitely "inspired by" and not a direct copy, as the games feel very different. War can even ride his horse in many of the open areas, and teleport from shop to shop, so you aren't stuck walking everywhere. Since this is an action/adventure game, if there are any hard parts, you just have to get better at the game. Grinding won't do much for you. Even so, the game is perfectly complete-able on the Easy and Normal setting, although Hard gave me a lot of trouble back when I played the original. Beating bosses and other difficult enemies is all about reading patterns and using the right tool or attack. The game has several dungeons, and runs about 15-20 hours depending on how much extra treasure you want to find. While there is no real new game plus, you can keep the abyssal armor if you manage to find all 10 pieces, which makes the harder difficulties much more manageable. Achievements and trophies are the same as they were for the original release, so if you got them there, you can do it again. As mentioned at the start, the game looks really good. The graphics and frame rate are smooth, and the lighting looks natural. Besides the too smooth graphics when rotating the camera, I have two other problems with this remaster. First, explosion sounds don't always play when they should. If you are right next to them, they make noise, but being a bit away from them (which you really should do for explosions) makes no sound. Another thing that cropped up was random graphic effects just appearing on the screen. Stuff like lava bursts and the energy the swirls around the flight orbs would just appear at random places of the screen sometimes. I'm not sure what it was tied to, but it would go away after closing out the game. It's not a big deal, as it didn't impede gameplay, but it was noticeable. 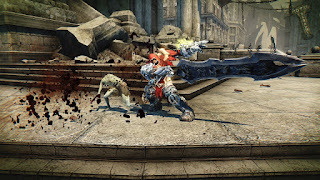 I enjoyed playing both Darksiders games, even with the differences between them. Small annoyances aside, this is the best version of the first game, and well worth playing for action/adventure fans, especially if you like visceral combat and light puzzle solving. Upon release several years ago, the original was likened to God of War crossed with Legend of Zelda, which is accurate, but I enjoyed Darksiders more than either of those. If you skipped it last generation, then I recommend playing the game. However, if you already have completed it, the Warmastered Edition doesn't add anything new except a very pretty coat of paint. The best looking and running version of a good and fun action/adventure game. A few odd graphic and sound glitches. The dungeon with the Portal-like gun gives me a headache. Hopefully, this and Darksiders II Deathinitive Edition sold well enough to justify a third game. I want to continue the story of the Horsemen! After checking out the import copy of Dragon Quest Heroes lent to me by my friend, I eventually bought my own copy of the US release. More than just a Dynasty Warriors game with a Dragon Quest skin, they game does add new elements to a familiar formula, even if it isn't always for the best. Combos are similar to the Warriors games, with weak and strong attacks. For some characters, the strong attack at the end of a combo will give different moves. Unfortunately, this is for less than half of the characters. Even more unfortunate, the combo caps out at four attacks. The rest of the characters have even less moves, so the normal attack strings end up feeling too simplified and limiting, even if there are some cool effects with them. Even more strange, this is the more complex mode for attacking. I'm not sure what they are saying about Dragon Quest players, but this is far from the most appropriate Warriors-style game to put that limitation in. Each character will also have some magic skills to use. These are mapped to the face buttons when holding the correct shoulder button. Most are attacks of some kind, but the characters usually have one buff or heal, too. These all cost MP to cast, and some can be charged if you buy the appropriate skill. Most are really cool to look at and helpful in combat. Whenever a character levels up, they gain skill points that you can use to buy the action skills or a whole host of passives. Some take a lot of skill points, so either save up, or pony up the gold to re-spec. Thankfully, that is an option. Besides the normal combat, Dragon Quest Heroes has many stages where you must defend an object or person from waves of enemies. At various corners of the map, there are enemies that open a portal to summon more and more enemies. Since you can't break up your party, or enlist the help of another player, you must use the very monsters you are fighting. Sometimes fallen foes drop monster coins, which can be used to summon a monster to help out. There are two flavors, sentry and savior. Savior is basically summoning the monster for an attack, and the coin is gone afterwards. Sentry monsters stay around the area summoned to, and help fight off other monsters. Basically, you want to kill monsters, get the coins, and summon them to defend one or more lines from the portals, while you run to the other and clear it out. Rinse and repeat until all the portals are down and the monsters flee. The story mode boils down to three stages types. First is kill all, which is pretty self explanatory. Second are the defensive missions explained above. Third are the boss fights, which are against giant creatures. Usually there are turrets or something else around to help you fight these gigantic threats. I think the defending missions are an okay addition to the game, but there were too many of them for my taste. This felt really out of place, since tower defense isn't an integral part of either the Warriors games or Dragon Quest. I would have preferred a few more kill all, and maybe some bigger maps for them, too. A few more traditional DW style levels would not have hurt the game. The story is a pretty loose good versus evil tale that makes excuses to toss in characters from different Dragon Quest worlds and make you have to protect someone or something a lot of the time. It's not overly hard, but sometimes enemies dish out very high damage for no real reason. There are also a multitude of side quests to take on, which are usually go kill X amount of Y enemy, or bring me X of Y item. Rewards are money or extra items to help with the accessory crafting system. While you cannot replay story missions, you can go to their areas and fight never ending streams of monsters. These are what you use to grind for either experience or items, and it actually works pretty well. Although, giving more experience would have been a nice boon, or at least having much smaller areas that just keep spawning enemies. I really like these stage types, but they could be fantastic with a little tweaking. It would be nice to have these in other Warriors-style games. If you read my preview of the import version, you may remember that I liked the way the game looks, but am not too keen on the audio. This still holds true for the localized version. The game looks great. Akira Toriyama's art style translated wonderfully to 3D. The locations and spell effects are really cool looking. While the music and sound effects are super legit and appropriate, they feel really disjointed because they feel so old. While I almost always love it when a game is so appreciative of its source, I think they could have made the sounds more modern to better fit with the game. Also, there are a few other holdovers from the Dragon Quest RPGs that drag down the experience. Some functions, like saving and pretty much everything else on the airship, just have too much text. I know you came from an RPG, you don't have to have extra text every time I need to use these services, save that for actual dialogue. After saving at the church, they still ask if you want to go to the title screen. Yes, it is traditional in a DQ game to have that, but it hasn't been necessary for the last 20 years, either. So, is the game worth playing? If you are a Warriors fan, it is worth trying out, but only buy it if you really like the defending stages. Fans of Dragon Quest will likely get more out of this, as it is legit to a fault in its presentation. The game was fun, but the tower defense missions were too numerous for something that isn't appropriate to either involved franchise. The game looks great, and adds a new mechanic to a familiar formula. However, they use that new mechanic too much. The old school sounds are appropriate, but don't mesh with the rest of the presentation. I really wish I could disable the characters talking through the controller's microphone. It's really annoying. I do hope they make a more traditional mash-up with Final Fantasy soon! After abruptly losing her dog, a little girl goes home and her sister goes to look for it. As it gets darker, the little girl ventures out to find her sister. However, you will soon learn that scary monster lurk around every corner. It is up to you to guide the girl to safety and locate her sister in one of the Vita's scariest and creepiest offering, Yomawari: Night Alone. At first glance, the game looks like a horror game, and it that is fairly accurate. You play as a little girl, who has no weapons against the evil shadows that roam the town. Therefore, it is a lot like a survival horror game. You quickly get a flashlight that can show you where most monsters are, and you have to either avoid them, run away from them, or sneak by. It took me way too long to realize the right stick can aim the flashlight. It's really useful, but I do find myself swinging it around from side to side like a paranoid horror movie extra. And just like them, if the girl gets caught, she gets killed. There are places around town for you to hide. While hiding, you can only see the girl, and vague red mist that represents the enemies. There's also a heartbeat that lets you know how close they are. It really keeps the adrenaline pumping while you are hiding. Overall, the game has a great presentation that is unsettling and creepy without being graphic (see Corpse Party if that's what you want). While on your quest to find your sister, you have various places that you can go to that change during the course of the game. Some place may not be open when you first wander by it, but you will eventually need to go there. Along the way, you have some basic puzzles to figure out, like finding items that let you pass areas or unlock doors. So in addition to dodging various ghosts and monsters, you also need to solve how to get to where you need to go. The girl can also pic up rocks, coins and fish crackers. Rocks can distract monsters, fish crackers feed cats, but coins have the best use. Whenever you go by a Jizo statue, you can offer a coin to make a quick save. They also act as teleporters, that can move you quickly from one statue to another. The girl can also return to her house from the map, if you want to full save. Then, stop by the nearest statue and jump right back in to whatever you were just doing (porting around doesn't cost a coin). I'm one of those people that saves a lot (Psycho Mantis told me I like to kick my tires before I leave), so this is a very useful function. It's pretty easy to pass by some of the side stuff in the game if you focus on the story, but you are allowed to go back at the end of the game and other points to get the extra items. 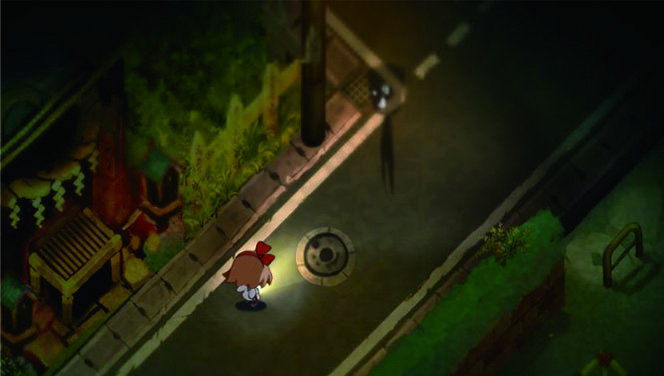 Yomawari is a pretty fun and creepy game that offers a few hours of playtime. It's part survival horror and part puzzle, and while you will die easily and repeatedly, it's not that frustrating. Well, unless you can't figure out where to go and what to do. It's a solid offering on the PS Vita for horror fans, or even puzzle gamers. Great at setting the tone for the game early on. A very creepy game. Not always clear where to go/what to do. Sometimes you can actually go past things that it appears to steer you away from. While I'm not a fan of limited saves, like ink ribbons, paying coins to Jizo was a cute and appropriate way to do it, so I can't be too mad. 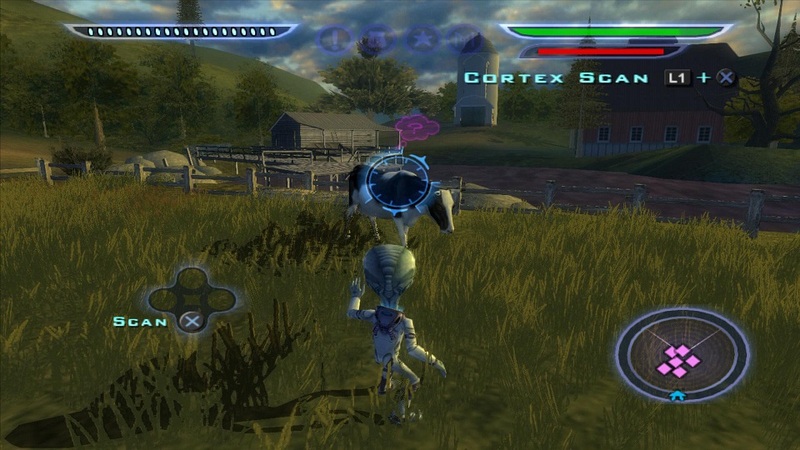 My first foray into the Destroy All Humans! franchise was with its final game, Path of the Furon, on the Xbox 360. I was interested in the series before that, but for one reason or another didn't try it out. So, I jumped on the chance to review the first game when it was released on PS4. Admittedly, I thought it was one of the popular remasters that are plag-, uh, I mean, ever present in our current gaming scene. However, it is one of the PS2 games being released on PS4, meaning it only really has upscaled graphics and trophies. It's also widescreen, except for the cinematics. It was quickly apparent just how much the game was from the PS2 era. The controls felt a bit off for some of the functions. For example, R1 is shoot, which is definitely an old school Playstation thing. The one that got me the most, even after several hours, is that going back from a menu isn't the ever useful Circle button. For whatever reason, it is the Triangle button. There's also fall damage, and you may know that I don't really like that, especially in a game where they give you a jetpack. I've been able to avoid it for the most part, but there are still times I fall just a bit too far, even if it doesn't feel like it, and take some damage. When I say "damage", I don't really mean health damage. Crypto has regenerating shields, but doesn't seem to be able to take a hit past that. You don't get hit too often, but the damage when you do seems high. I'll pretty much chalk all of these things up as signs of the time. I don't really expect them to be changed in a non-remastered remastered release, but it is something to be aware of. It is a good way to remind people what games where like, even 10 years ago. Crypto gets several weapons in his fight against humanity. First is his gun, which can shoot a steady stream of energy. This shocks the target, and can jump to others nearby as well. It does get upgrades that allow it to change into a disintegration ray and fire explosive shots, among others. Most shots have limited ammo, but the basic blaster has a recharging energy meter. Besides his gun, Crypto has some mental powers at his disposal. He can levitate things with his mind, and even read the thoughts of others. He can assume the disguise of any one walking around, which helps keep the alert meter down. Too bad you can't pick up anything while in disguise. To top it all off, Crypto can climb into his saucer and lay waste to enemy vehicles and buildings. Yes, it is fun, but the energy of the death ray drains a little too fast for my tastes. Thinking back to Path of the Furon, I think most of these minor complaints were ironed out and made more fun by then. The game is mission based. When you enter the area of your next mission, it starts automatically. When you finish, the game saves and you get your reward. 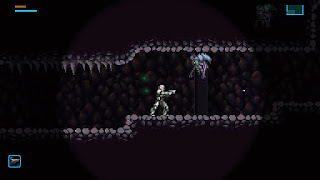 You are allowed to roam around the surrounding area, but you have to beam back up to your ship to get the next mission. It's a very strange design decision. If you don't want to take the next mission, you can always stay down in the area, or return to a previous area for side missions and collectibles. Too bad there aren't any in-game maps to help you. Plus, the side mission markers don't disappear, or change appearance in any way to signify that you have completed them. It's not a deal breaker, but it's really annoying to try and remember which side missions you have done when there is no real way to keep track in the game. The game takes about 10 hours to do all the missions, and a few more if you do the side missions and collectibles. It's not overly tough, but there are definitely some harder missions that may cause you to go back to the spaceship and try again. No mid-mission checkpoints here! You will also get shot a lot when running around to grab the collectibles, since there is no stealthy way to get them. Again, not a huge deal, but it does get annoying after a few minutes of getting attacked from the constantly respawning enemies while you are just trying to track down the last few probes. However, you can use the cheat codes to your hearts content (and I'd even recommend it for a few missions) without disabling trophies. Take that modern gaming! Overall, Destroy All Humans! was pretty fun, but it definitely shows its age. The shooting and mental powers gameplay is solid, and I really enjoy the humor of the game. The mission structure could be better, and I would have liked a few improvements to the game to make it an actual remaster instead of just an upscaled re-release. If you have not played the franchise and want a jumping in point, this is a good place to start. Funny game with a good premise. Killing enemies with the disintegration ray is cool. Having to go back to the ship to take the next mission, and no checkpoints in longer, multi-part missions. I've heard the sequel was the best of the series, so I hope that's next to get re-released. I enjoy playing visual novels, and really wanted to try STEINS;GATE when it first released on the Vita. I didn't get a chance to, so I jumped at the chance to try out the PC version. The game starts out introducing us to the main character that we will be following around and he's...well, an idiot. Okabe Rintaro (Japanese order) fancies himself a mad scientist (named Hououin Kyouma) on the run from the evil Organization. He's pretty much that guy that didn't really grow-up, and still plays pretend. Even so, his silliness is the cause of some funny dialogue (I like that he keeps adding "name subject to change" for the Phonewave), and a surprising amount of other characters go along with his disillusion. There are a surprising amount of pop culture references, and they even figure in to the plot, some heavier than others. Many of the references are obvious, but the names are changed. All entries are put into the game's encyclopedia so you can read them later if you so desire. The pop culture reference might make you think the game is a more silly, parody type of game, but it isn't. There is a scene early on that at first glance would support that, but...well, I don't want to ruin it. The game, and the science it presents, are both taken seriously. I'll admit I don't know if all of the science was accurate when the game was created, but what little I do recognize seems legitimate. 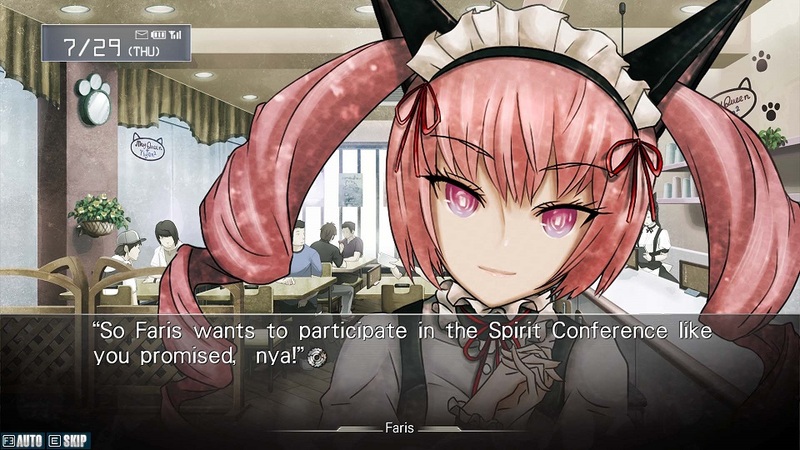 STEINS;GATE is also a very long game, especially for a visual novel. Clocking in at around 25 hours (assuming you read the story, which you should! ), it takes several hours to even get to the first branching path. There are six different endings to uncover as well as befriending the various characters through phone email responses. Unless you want to re-read a big chunk of the game, creative use of the save files is recommended. Thankfully you get more than enough, and you can even lock them so you don't accidentally save over them! The game ran really well on my PC. As a visual novel, it should run fine on many machines. I tried using both mouse and keyboard and a controller to play the game. Since a vast majority of the game is reading, either works well enough for that. There are several points where you have to take out your phone, whether to read messages or respond to emails, and here is where I have to recommend the controller. Despite having many more buttons on it, the keyboard doesn't seem to have one that calls up the phone. The options only list the controller buttons, which are, by default, mapped to the triggers on an Xbox 360 controller. I didn't see an option to set it on the keyboard, which effectively locks off an important function in the game. STEINS;GATE was a really good story, and a good visual novel. It does take awhile to get going, but that's because the story is long and involved. I had fun playing the game, however I still would prefer to play the Vita version. Even so, the game is an easy recommendation to science fans, and fans of visual novels. Definitely a great one, and I'm looking forward to the sequel! A very hefty length for a visual novel with a really good story. Locking save files is a great idea. The story is a slow burn that takes awhile to really get going. The early scene with the alpaca game was done brilliantly. When I first saw footage of Exile's End, I was definitely intrigued. 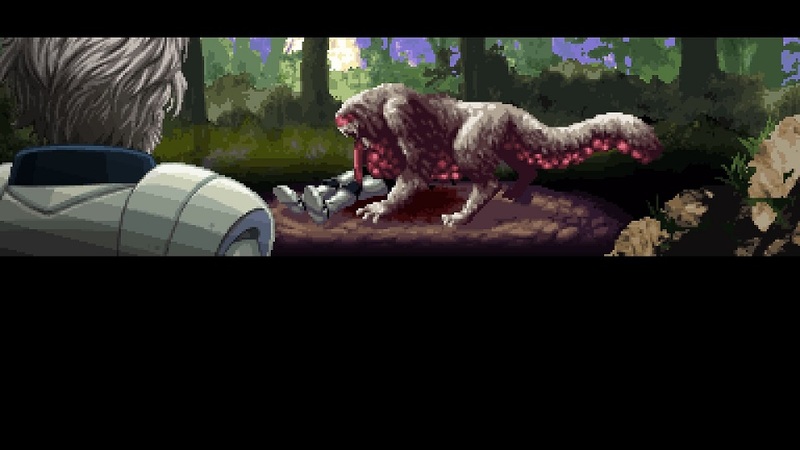 It appeared to be a metroidvania game, which is a genre I very much enjoy. When I tried the game out, I soon learned that is only part of what the game is. Especially in the beginning, the game feels more like a survival horror game. Why is that? Well, you don't have any weapons at the start of the game. In fact, you can't even fall too far without taking damage. I already dislike fall damage, and putting it in a game like this doesn't make me like it any more. It slows down the first few minutes of the game. While it gets corrected quickly, it still leaves its stain on the rest of the experience. The weapon situation, though, is far more annoying. While I can accept not starting the game with a weapon, the first one you get is a rock. Yup, just a plain rock. You can hold a few, and even retrieve them after thrown (as long as you don't leave the screen), but they are next to useless. For starters, they fly in an arc. If that doesn't sound bad to you, you obviously have not experienced that, or seen the AVGN video on Friday the 13th on NES. After what feels like forever (although it is only about 15-30 excruciating minutes), you get a pistol. It thankfully has unlimited ammo, and works pretty well, even if it is weak. Other weapons you get are limited by either ammo or energy, making them useful only in certain situations. Otherwise, stick with the pistol. One of my biggest problems with the game is some poor design choices. The best example is a point where you have to destroy alien...thingys...sitting on the ground. You come across one, the character remarks about it, and you move on. Trouble is, you can blow them up with grenades. It's not mentioned, so you would have to try that to see it's possible. Furthermore, you don't even know you have to do it. It removes some stone barriers that block your path. Too bad the alien devices are far enough away that it's far fetched to think there is a connection. However, there is one that is that is right in front of one, so you can see it. It's behind another one, meaning you have to figure it out before the game shows you it is possible. Now, I don't want it to have a cut scene every time a door opens (thanks, Legend of Zelda! ), but it's not too much to ask to have something designed well enough that it can be figured out in a reasonable amount of time. There's more stuff like this in the game, such as the black background of the health and energy meter blending in too much, staying crouched after landing from a high jump/fall, or the disproportionate amount of energy pickups to health ones. They may be small on their own, but adding them all together makes it a big problem. There are no save point areas in the game, as the game auto saves whenever you enter a screen. This is both good and bad. Good because if when you die, you don't start back too far from where you were. Bad because you can easily get stuck. A save room usually would refill your health, so you get none of that in Exile's End. Instead, you can get stuck with low HP, and having to hope you can kill the next enemy and that it drops health so you can survive and not get sent to the title screen repeatedly. There were times that I contemplated starting over, since I was in a tough spot with a sliver of HP left. That's not really a good thing. That might not be as big of an issue, but the game is filled with cheap hits and deaths. The cheap deaths, usually done by floors of spikes you can't see until it is too late, are easier to deal with, since they are spaced apart and the frequent auto saves mitigate their threat. The cheap hits are far worse, since they take advantage of those frequent saves to hurt you. 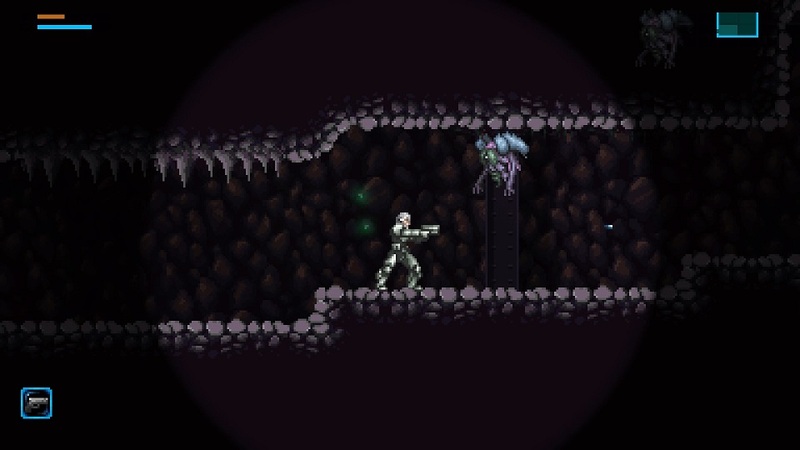 Besides instantly turning and shooting enemies, there are also enemies that pop onto the screen, leaving you next to no time to react to their inclusion. Top it off with numerous places that have ceiling spikes just outside of your camera range (and above ledges you have to jump to), and you have a recipe for making people quit. Exile's End ended up being a disappointment. Even thought the graphics are great, I was expecting a more metroidvania style game, not a awkward 2D wannabe Souls game dressed up like one. It thankfully isn't very long (there's a 3 hour speed run trophy), but it will definitely leave an impression. If you have exhausted all other metroidvania options on the PS4, then it might be worth trying out the game, but I definitely can't recommend it over other offerings on the console. The retro graphics, enemy and location designs are really good. Many puzzle and gameplay design choices. I'd be more specific here but you can just re-read above. Shmups! I love to play them, and we don't get near enough of them in the US. 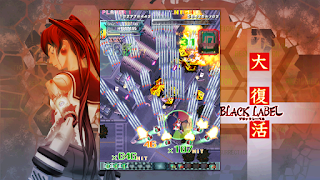 DoDonPachi Resurrection was one of those that was released for a home console (Xbox 360), but not in the US. Therefore, I was happy to jump at the chance to play and review the PC port of the game. Strangely, the system message are set to Japanese when I first loaded the game. Thankfully the menu was in English, so I was able to change that quickly. You are also greeted with a multitude of game types. There is Ver 1.5, which seems to be the core game. Next is Ver 1.51, which has some slight changes, plus you can get crazy points, but no achievements, sadly. Then there is Arrange B, which is like a score attack for a stage, and Arrange L, which doesn't have bombs or allow you to pick a ship, but you can change the position of your options (little satellites that shoot with you). Too bad this is the only mode that allows you to switch option positions, since I don't like the ship you are stuck with, but really like the position switching mechanic. Next are the three Black Label choices. 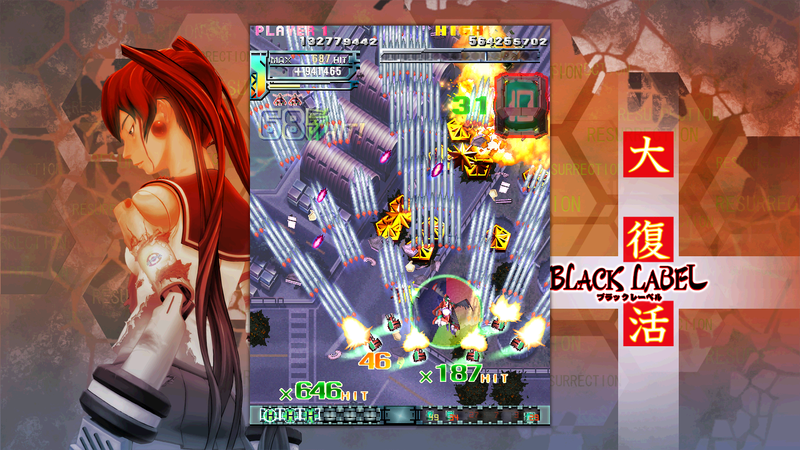 The one just called Black Label is a harder version of the core game, where enemies shoot many more bullets. Novice is an easier version, and Arrange is, well, slightly arranged. Also, Arrange doesn't allow you to choose a ship, but instead gives you a unique one to use. Too bad it's only used in this mode, since I really like this ship. Besides those, you can do Score Attack or Training versions of any of the aforementioned modes. Like most bullet-hell shmups, you move your ship around and shoot at lots of enemy crafts while dodging a ton of bullets. 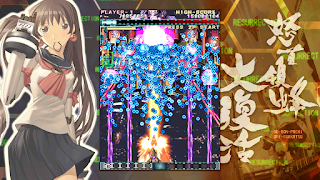 In DoDonPachi Resurrection, tapping the shoot button will fire your shots in more of a spread pattern, perfect for large waves of weak fighters. If you hold the button down, it concentrates your fire into a narrow laser. This is much stronger than the normal shot, but more focused, ideal for bosses and other tough enemies. I actually really like this system, since you can quickly and easily switch your shot type, with only needing one button. The only real downside is mashing the shot button so much when going through the stages. It would get really noisy with an arcade stick! In some of the modes, you can set each shot as a different button if the mechanic doesn't appeal to you. I only played the game with an Xbox 360 controller, and the stick moved the ship a bit too quickly for my tastes, which resulted in many a crashed ship. I don't think the keyboard and mouse would fix that problem for me, so I'd have to try out some different controllers to find a perfect fit. In some of the game modes, you can select bomb style, power style, or strong style (but can you be the king of it?). Bomb style is just what it sounds like, you have a stock of bombs. Power allows you to use Hyper mode, but you don't have bombs. Strong style is a combination of the two. Personally, I need the bombs more than the hyper mode. The bombs not only protect you by destroying enemy bullets, but they also do damage and even activate automatically when you are hit (in most of the modes). Hyper mode requires filling a gauge, but when you activate it, your shots are much bigger and stronger. Seeing it with the spread is screen-clearingly fun! As fun as the game is, I did have a few problems with it. Mostly, it is the numerous little systems in the game that it doesn't explain (or if it doesn't, I haven't found where). Hyper mode requires filling a meter...sometimes. Others, it takes from you bomb stock. I'm not sure which is when. There's also a Red Gauge in some modes. I have no real idea what it does or how to fill it. I assume the enemies fire more bullets when it is full, but that is just a guess on my part. Black Label has numbered chips to collect. I don't know how to make them spawn as certain numbers, or exactly how they work. I only know they are multiplier chips because of the achievement descriptions. Lastly, many enemies have laser attacks. These aren't avoidable, so you have to use your laser attack, which shields you from them. I eventually figured that out, but knowing it ahead of time would have been nice. Being a shmup, a normal game only lasts about 30 minutes. Of course, the point of these games is not usually to beat it, but to beat it on one credit. I'm not sure I ever could beat this particular game on one credit, as the later levels are really crazy with the shots everywhere. Plus, the secret boss at the end is beyond ridiculous with its attacks and HP. I do want to get better at the game, since I think it is fun (except the secret boss). If you are a stickler for achievements, the game has 100 of them for you to try. They are spread across the various modes (mostly normal and black label though), but 100 seems like an excessively high number. 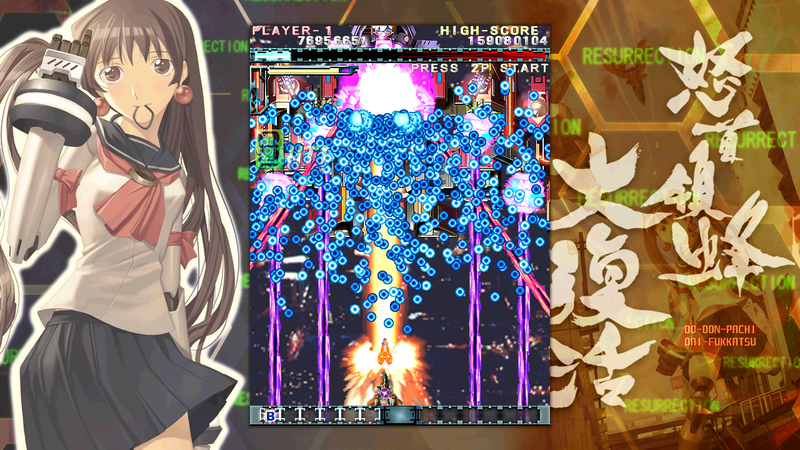 DoDonPachi Resurrection is a fun shmup that I would definitely recommend to fans of the genre. It's not the most clear in terms of mechanics, but it does offer multiple modes to play around in. For shmup fans, I would say it is worth the price, as you will get your money's worth playing all the modes, getting better at the game, and maybe even trying for the long list of achievements. The two shot type system works surprisingly well, lots of game types. Even on the default setting, the later levels are crazy. It can be really easy to lose yourself in all the pretty effects everywhere. The secret boss got really boring after fighting him for 20 minutes. It really needs a lot less health, that is ridiculous.